WASHINGTON, Sep 26 (IPS) - Despite mounting pledges of assistance, the continuing spread of the deadly Ebola virus in West Africa is outpacing regional and international efforts to stop it, according to world leaders and global health experts. "We are not moving fast enough. We are not doing enough," declared U.S. President Barack Obama at a special meeting on the Ebola crisis at the United Nations in New York Thursday. He warned that "hundreds of thousands" of people could be killed by the epidemic in the coming months unless the international community provided the necessary resources. He was joined by World Bank President Jim Yong Kim who announced his institution would nearly double its financing to 400 million dollars to help the worst-affected countries – Guinea, Liberia, and Sierra Leone – cope with the crisis. "We can – we must – all move more swiftly to contain the spread of Ebola and help these countries and their people," according to Kim, much of whose professional career has been devoted to improving health services for people around the world. 3"Too many lives have been lost already, and the fate of thousands of others depends upon a response that can contain and then stop this epidemic," he said. Indeed, concern about the spread of the epidemic has increased sharply here in recent days, particularly in light of projections released earlier this week by the Atlanta-based U.S. Center for Disease Control and Prevention (CDC), which has sent scores of experts to the region. It found that Sierra Leone and Liberia alone could have a total of more than 20,000 new cases of Ebola within six weeks and as many as 1.4 million by Jan. 20, 2015, if the virus continues spreading at its current rate. Moreover, global health officials have revised upwards – from 55 percent to 70 percent – the mortality rate of those infected with the virus whose latest outbreak appears to have begun in a remote village in Guinea before spreading southwards into two nations that have only relatively recently begun to recover from devastating civil wars. Officially, almost 3,000 people have died from the latest outbreak, which began last spring. But most experts believe the official figures are far too conservative, because many cases have not been reported to the authorities, especially in remote regions of the three affected countries. "Staff at the outbreak sites see evidence that the numbers of reported cases and deaths vastly underestimate the magnitude of the outbreak, according to the World Health Organisation (WHO), which is overseeing the global effort to combat the virus's spread. In addition to the staggering human costs, the economic toll is also proving dire, if not catastrophic, as the fear of contagion and the resort by governments to a variety of quarantine measures have seriously disrupted normal transport, trade, and commerce. In a study released last week, the World Bank found that inflation and prices of basic staples that had been contained during the last few months are now rising rapidly upwards in response to shortages, panic buying, and speculation. The study, which did not factor in the latest CDC estimates, projected potential economic losses for all three countries in 2014 at 359 million dollars – or an average of about a three-percent decline in what their economic output would otherwise have been. The impact for 2015 could reach more than 800 million dollars, with the Liberian economy likely to be hardest hit among the three, which were already among the world's poorest nations. "This is a humanitarian catastrophe, first and foremost," Kim said Thursday. "But the economic ramifications are very broad and could be long lasting. Our assessment shows a much more severe economic impact on affected countries than was previously estimated." Moreover, security analysts have warned that the epidemic could also provoke political crises and upheaval in any or all of the affected countries, effectively unravelling years of efforts to stabilise the region. In a statement released Tuesday, the Brussels-based International Crisis Group (ICG) warned that the hardest hit countries already "face widespread chaos and, potentially, collapse," in part due to the distrust between citizens and their governments, as shown by the sometimes violent resistance to often military-enforced quarantine and other official efforts to halt the virus's spread. Food shortages could also provoke popular uprisings against local authorities. "In all three countries, past civil conflicts fuelled by local and regional antagonisms could resurface," according to the ICG statement which warned that the virus could also spread to Guinea-Bissau and Gambia, both of which, like the three core nations, lack health systems that can cope with the challenge. Obama, who Friday will host 44 countries that have enlisted in his administration's Global Health Security Agenda, himself echoed some of these concerns, stressing that containing Ebola "is as important a national security priority for my team as anything else that's out there." Earlier this month, WHO estimated that it will cost a minimum of 600 million dollars – now generally considered too low a figure –to halt the disease's spread of which somewhat more than 300 million dollars has materialised to date. The U.S. has so far pledged more than 500 million dollars and 3,000 troops who are being deployed to the region, along with the CDC specialists. Even that contribution has been criticised as too little by some regional and health experts. "…he number of new Ebola cases each week far exceeds the number of hospital beds in Sierra Leone and Liberia," according to John Campbell, a West Africa specialist at the Council on Foreign Relations (CFR), who cited a recent article in the ‘New England Journal of Medicine'. "It is hard to see how President Obama's promise to send 3,000 military personnel to Liberia to build hospitals with a total of 1,700 beds can be transformative," he wrote on the CFR website. "The assistance by the United Kingdom to Sierra Leone and France to Guinea is even smaller," he noted. A number of foundations have also pledged help. The Bill and Melinda Gates Foundation, which has spent billions of dollars to improve health conditions in sub-Saharan Africa, has committed 50 million dollars, while Microsoft co-founder Paul Allen's foundation has pledged 65 million dollars to the cause. The California-based William and Flora Hewlett Foundation announced Thursday it had committed five million dollars to be channelled through half a dozen non-governmental organisations. 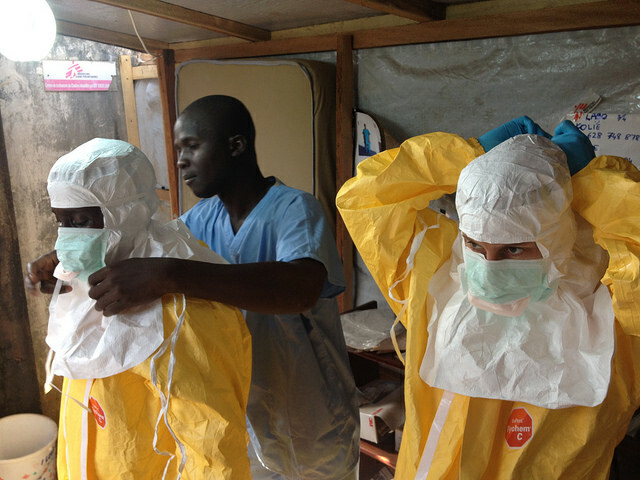 But whether such contributions will be sufficient remains doubtful, particularly given the dearth of trained staff and adequate facilities in the most-affected countries and the speed at which the pledged support is being delivered – a message that was underlined here Thursday by Joanne Liu, international president of Doctors Without Borders (MSF), which has been deeply engaged in the battle against Ebola. "Generous pledges of aid and unprecedented U.N. resolutions are very welcome," she said. "But they will mean little, unless they are translated into immediate action. The reality on the ground today is this: the promised surge has not yet delivered," she added. "Our 150-bed facility in Monrovia opens for just thirty minutes each morning. Only a few people are admitted – to fill beds made empty by those who died overnight," she said. "The sick continue to be turned away, only to return home and spread the virus among loved ones and neighbours." "Don't cut corners. Massive, direct action is the only way," she declared. Obama himself repeatedly stressed the urgency, comparing the challenge to "a marathon, but you have to run it like a sprint." "And that's only possible if everybody chips in, if every nation and every organisation takes this seriously. Everybody here has to do more," he said.